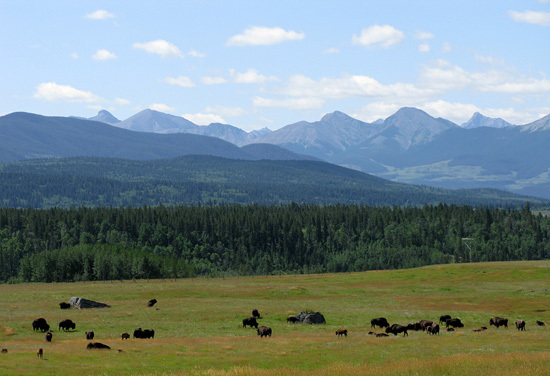 The Ĩyãħé Nakoda have always lived in harmony with the environment. There is an intrinsic bond with nature, and the Ĩyãħé Nakoda have faithfully served as guardians, understanding and abiding by its laws. According to oral history, this deep connection with the natural world and respect by the Ĩyãħé Nakoda for the earth, plants, animals, and the heavens, formed a balanced practical and spiritual relationship. it was time to break camp and relocate, or when a storm was approaching, by the forecasts from nature. Sometimes, ducks would nest near a camp of Ĩyãħé Nakoda to be safe. Natural enemies of the ducks would not approach the Ĩyãħé Nakoda, and the ducks instinctively knew this. By counting migrating geese, the Ĩyãħé Nakoda knew if the flocks were large in number they could take some of their big eggs and include them in their meal, as a gift. When there was a heavy summer rain, deer would go out in the open areas. To remain in the trees meant the sound of the rain falling on the leaves would drown out the sound of approaching danger. The Ĩyãħé Nakoda knew that was the time to stalk through the forest and kill the deer. Which to kill of an animal species was knowledge acquired by the skilled Ĩyãħé Nakoda hunters. Deer and other horned animals were never killed during the seasons of the rut (mating season). Wildlife was never killed for sport. A killed animal served the Ĩyãħé Nakoda by providing them with food, clothing, tools, medicines, material for tipis, ropes, weapons for hunting and for war, and adornments. Interaction by the Ĩyãħé Nakoda with plant life required extensive knowledge of what, where, and when to harvest. Various plants provided food sources, while medicine compounds were derived from others. The Ĩyãħé Nakoda followed a lunar calendar and could tell by the shape of the moon what the weather would be. Days in advance, some among the Ĩyãħé Nakoda could predict when a particularly harsh storm was heading toward them. In nature, it was not unusual to observe a herd of buffalo gather, and then head in the direction of an oncoming storm. The front of their bodies served as their protection. When the stars were exceptionally bright, the Ĩyãħé Nakoda knew that very soon it would be cold. Twinkling of stars indicated a change of weather. The stars were also used for navigation purposes. Some among the Ĩyãħé Nakoda believed certain configurations in the stars foretold mystical happenings. The close relationship the Ĩyãħé Nakoda have always had with nature remains to this day.